Herald: Parrikar is half way there, but has he left a mark? Sujay: Parrikar. Is he the same man who left office or has he changed? He tends to show that he listens more than he talks. Earlier it used to be said that he used to talk more than he listened. He was voted to power as the people were absolutely fed up with the way things were done by the Congress. But is the work culture still the same? Manoj: When he took over in the earlier term it was the first time he became Chief Minister. This time he has gathered a lot of experience. The work culture is the same. He gets to work early and stays on till late night every day. Sujay: But do you feel that there is a feeling of despondency? Maybe he is a creature of circumstances. The economy is in a shambles; the mining issue came up. But he had promised a lot in terms of all round governance. He promised to take the people along. Why is there a feeling that he is a one man show and doing a solo? Manoj: I agree with that because he generally likes to do the work himself. He feels that maybe because of his experience he can do things in a better way. But on the other hand he has given a lot. But everybody wants to be connected to him, so everybody wants to meet him. This is not possible. Anand: From what I have seen, he is very capable. He can get a lot of work done. Last time he gave an excuse saying that he did not have the mandate to do the work. This time the people have given him the mandate. Unfortunately, he does not have the ability to delegate the work. He wants to do everything on his own. He does not allow people to work on their own. For example he did not allow the Regional Plan to go forward saying that the mining problem was there. But there is a whole department that was doing a fantastic job. But he did not allow them to go forward. In other departments too, he is getting into everything. He has not changed in the least unfortunately. Sujay: When Parrikar was voted into power, there was a single point issue. He was the hope against corruption and family raj. Corruption played a very important part in his victory. Every Congressman who was tainted was booted out of power. People thought that once Parrikar came to power all these saints would go marching into jail. But when one story appeared on the GIDC scam he registered an unnamed FIR. Nothing happened on PWD scams except targeting some small and not so small fish. Do you feel it is too early to judge him on this issue or is he just using corruption as a tool? Manguirish: We thought that initially when the top is in the right direction, the entire system will fall in place. He started with a bang. But so far it is a whimper. Maybe he does not have a grasp on the grassroots. In the Centre, I find that if Modi finds ministers not upto the mark, he appoints strong secretaries and then he reviews their performance on a day-to-day basis. I feel this is the way to go instead of Parrikar over exerting himself on all issues. Sujay: On corruption, why is he taking so long to take action? Manoj: He has always said that investigations are on and everything will have in place. Anand: Everything is in the future. Two-and-a-half years have passed. Nothing has changed. Ask any man on the street. If you go to any government department including the police, people are there with their hands out asking for money. Are you saying that this does not reach the ears of the Chief Minister as it comes to our ears? To get into a government job you have to pay. Then they start recovering. Sujay: He has openly admitted that most of the officers are corrupt. Anand: If I say that the whole department is corrupt, then why does he not take any action? Since the day that the statement was made has any action been taken? Are we to believe that they have his blessings? Manguirish: You can’t underestimate anybody. Everybody learns by experience. If you allow them to function in the manner they deserve, they will do it. Manoj: Every person can flower in case he is given responsibility. In the next 6 months he should delegate more. Sujay: Looking into the whole issue of delegation. Yes you should delegate. But does he have competent people to delegate too? Do you feel that he has tackled corruption in his own cabinet? I for one refuse to believe that. My basic charge is that he has allowed corruption to flower under his watch by ignoring the activities of his ministers. The point is that he either allows corruption to flower or he does not just know. Anand: Corruption has flourished. Why has it flourished; by allowing it to happen; by acts of commission and omission? Manoj: If he is in the know he has to take action. If you take action on one in the administration, others will fall in place. Mangurish: What benefit has accrued to the state while some have gone on junkets. I don’t see and I don’t think (there is any benefit). I have not seen any reports. Sujay: Thank you for a very lively first half. 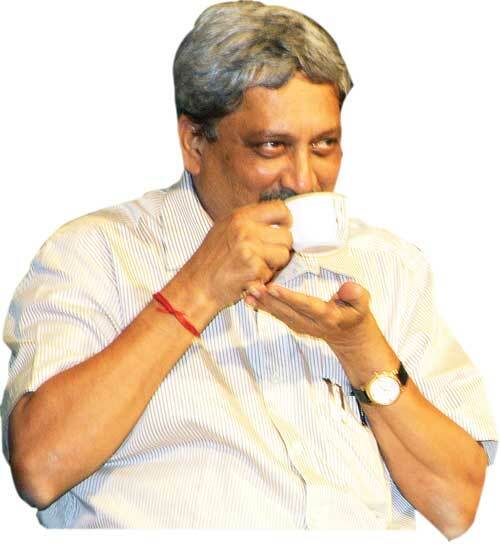 As the Mayor of Panjim joins us in the second half we look at whether Parrikar has walked the talk on key issues.